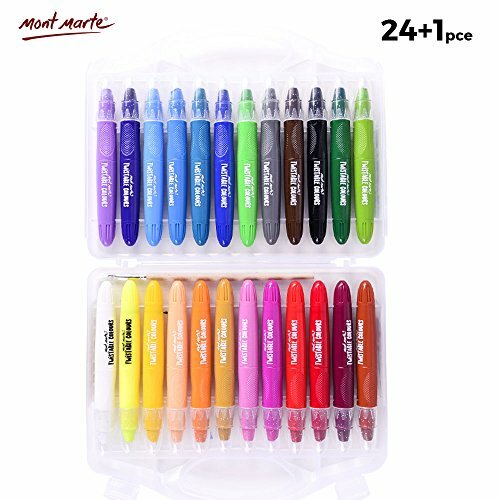 Mont Marte Studio Twistable pens come in 24 brilliantly vibrant colours. With a thick pen body and easy grip handle, these buttery pastel textures glide on effortlessly in thick, clean colour and blend smoothly to create a range of effects. Blend dry by hand or with water and included brush. Minimal transfer so blending fingers stay clean. Mont Marte crayons art set contains 24 pieces and a nice paint brush. There are nice classic crayons and colored oil pastels. Kids will enjoy fun and class will benefit a lot from these crayons. Thick body for easy grip and blendable colours for different effects. Crayons are Non-toxic and odourless, kids could use brush to blend wet.